WHY DONATE TO CAFETERIA CULTURE? ​then sharing our work - for free - with schools across the city and the US! Advocacy - students use the data that they have personally collected to inform policy! Collaboration - students build community and learn to respect others by working together on a common cause. Organized a YOUTH RALLY TO BAN FOAM at New York City Hall with over 200 students, attended by the Mayor and City Council Members; the next week, a judge ruled that the NYC foam ban is legal and went into effect on January 1, 2019! Led our first PLASTIC FREE LUNCH DAY with students at PS15 Patrick F Daly (Red Hook, Brooklyn) resulting in a 99% diversion rate of school cafeteria garbage! Is producing our first feature length movie, MICROPLASTIC MADNESS- Brooklyn take on plastic pollution - this impact video shares stories of 5th graders - living in Red Hook Brooklyn, who spent 2 years in our Plastic Free Waters Program and took local action to stop plastic marine pollution at the source! Help us to spur a youth-led plastic free waters campaign across the nation with this inspiring movie! Mentored 3,305 students in 6 schools! Using our SORT2save Kit, a Cafeteria Ranger student leadership program, our 5 partner schools diverted a total of 728 pounds of resources from the landfill or incinerator in just one day! With our tools in place to continue this good sorting, these schools are on target to divert 131,040 pounds of resources from the landfill or incinerator each school year. When all of New York City’s 1800 schools are able to reach this same diversion rate, we will bel turning 4,717,440 pounds of current waste into resources every year! That’s the weight of 550 adult elephants. PLEASE DONATE and help us to bring more ZERO WASTE CAFETERIA Program support to schools across NYC! Launched our multimedia SORT2SAVE KIT, Cafeteria Ranger Program, for ALL schools to use to use for FREE! 2.8 million public school students in NYC, LA, Chicago, Miami, Orlando,and Dallas. from landfills, incinerators, and student meals! ​Your generous donation to Cafeteria Culture is is tax deductible through our fiscal sponsor, Fund for the City of New York, a 501 c3 organization. just to export school and residential garbage. as far as way as North Carolina. through education, arts, media, and action. Thank you for your generous support! Please help us to continue this important work. Cafeteria Culture (CafCu) is creatively and collaboratively working to achieve zero waste schools and climate smart communities. Founded in 2009 as Styrofoam Out of Schools, we catalyzed the complete elimination of polystyrene (aka styrofoam) trays in NYC and the 5 other largest US urban school districts. As of this school year, our efforts will result in the elimination of half a BILLION styrofoam trays per year from landfills, incinerators, and our children’s school meals across the US. This has created an impressive domino effect, giving rise to the NYC School Organics Collection Program and the City’s recent goal to make all schools “Zero Waste Schools” by 2030. We achieved this remarkable victory by working in partnership with NYC Department of Education School Food Directors, parents, teachers, elected officials and students, who played a key role in winning this victory! 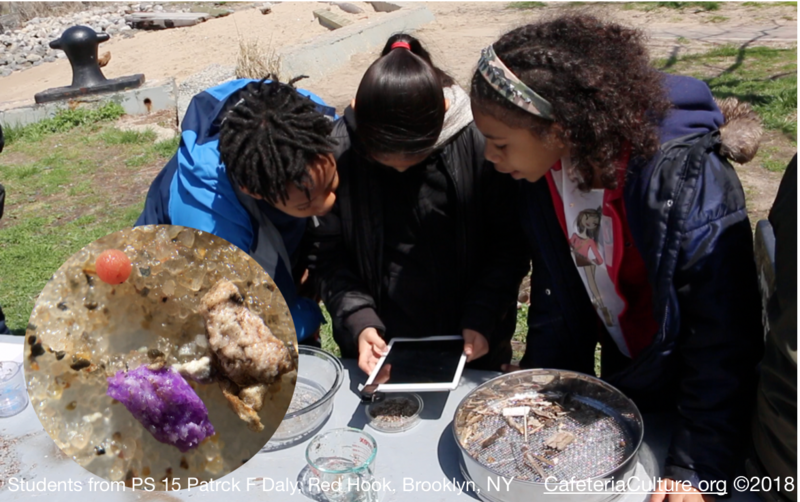 Central to our work is piloting innovative, hands-on environmental education with student leadership and climate action in school and neighboring communities. To date, we have primarily led our school programs in low-income communities of color in Manhattan and Brooklyn. We seek partner schools with different challenges in our quest to find solutions and develop cafeteria and classroom curricula that schools citywide can benefit from. Students who are most vulnerable to the effects of climate change are empowered through our programs to debate, ask questions, tell their own stories about food waste, garbage and environmental justice, and to participate in the design of effective solutions to these very immediate problems. ​Fund for the City of New York, a 501 c3 organization.